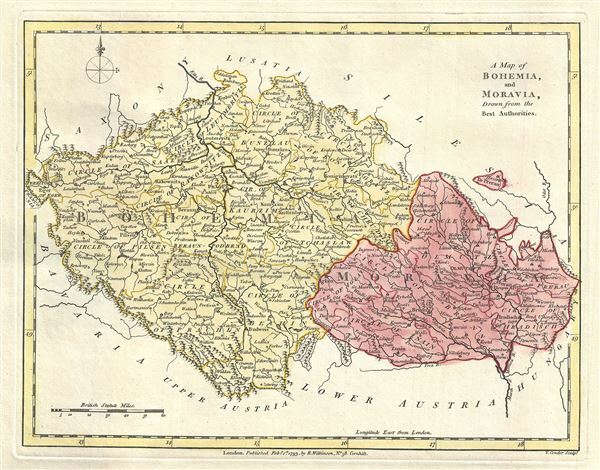 A Map of Bohemia, and Moravia, Drawn from the Best Authorities. This is a beautiful 1793 map of Bohemia and Moravia, Germany by Robert Wilkinson. It covers what is today the Czech Republic from Eger (Cheb) east as far as Ostrava. It notes numerous towns, rivers, cities, mountains and other topographical features. Today this is the Czech Republic. In 1794 Bohemia was in the midst of the Czech National Revival, in which Czech language, culture, and national identity witnessed a revival after decades of suppression under the Austro-Hungarian Empire. This map was engraved by Thomas Conder and issued as plate no. 21 in the 1792 edition of Robert Wilkinson's General Atlas.